in need of safety measures around Houston Street. A flatbed truck struck and killed a 58-year-old woman crossing West Houston Street on a scooter this morning. The police said that the victim was run over by the rear wheels of the trailer as it turned onto Sixth Avenue around 8:50 a.m. She was dragged to Minetta Lane before witnesses alerted the truck driver to the horrific accident. “There were a dozen people running up the street screaming and telling him to stop,” one witness told The Daily News. The latest accident only reinforced the perception that Houston Street is one of the most deadliest thoroughfares in the city. “Of course today’s tragedy is unique and we don’t know if any of these critical improvements would have prevented it. But we must do everything in our power to prevent the next one,” State Senator Daniel Squadron wrote in a statement, pointing to a bill that would strengthen penalties against reckless drivers, as well as recent safety improvements to Delancey Street. 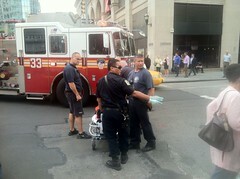 Another Cyclist Struck at Fourth Ave. and Ninth St.
Stephen Rex Brown Medics tend to the cyclist. A cyclist was hit by a cab after running a red light at East Ninth Street and Fourth Avenue shortly after 6:30 p.m., witnesses said. The cyclist was traveling west-bound on East Ninth Street, went through a red light and then managed to avoid one cab before being nailed by a second, Katarina Kojic said. “Luckily, I don’t think he hit his head,” she said. The victim was treated by Fire Department medics and put in an ambulance. Stephen Rex Brown All that’s left of the rack. 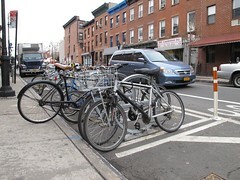 The bike rack on East Fourth Street that a scofflaw cyclist claimed as his own has been removed. Kyle, the East Fourth Street resident who had his bike stolen from the rack last weekend, noticed that the rack was gone this morning. Sure enough, where once was an arched beam with “Private Bike Rack” painted on it there is now nothing more than six bolts in the sidewalk. The Local is awaiting a response from The Department of Transportation, regarding whether it removed the rack between Avenues A and B. Back in October the department confirmed that it hadn’t installed the rack, and that it was illegal to claim it as one’s own. In fact, the department can bill whoever installed the rack for the expense of removing it. Of course, that seems unlikely given that the owner has never come forward, though rumors abound. Stephen Rex Brown Ten months after it first appeared, the “private” bike rack is still in place. 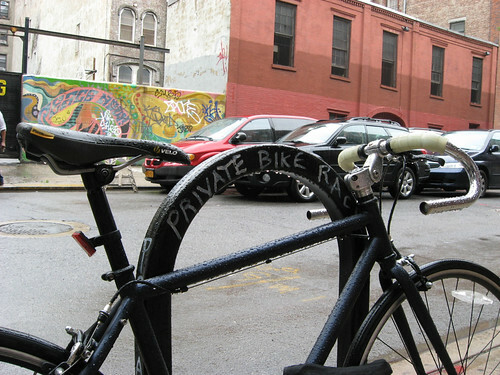 The city’s administrative code doesn’t allow it, but that hasn’t stopped someone from continuing to claim that the bike rack on East Fourth Street between Avenues A and B is private. 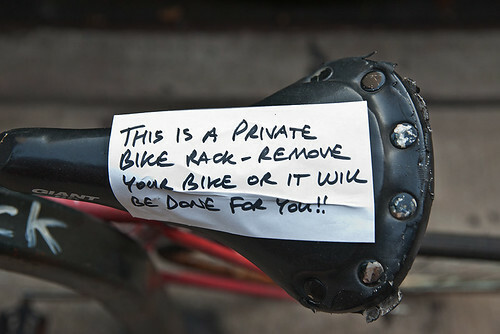 Now, one cyclist who dared to goad the person leaving menacing messages taped to bikes on the rack paid the ultimate price — his ride was stolen. The cyclist, Kyle, who asked to be identified by only his first name for fear of a confrontation with the person writing the nasty notes, lives in a building facing the rack. 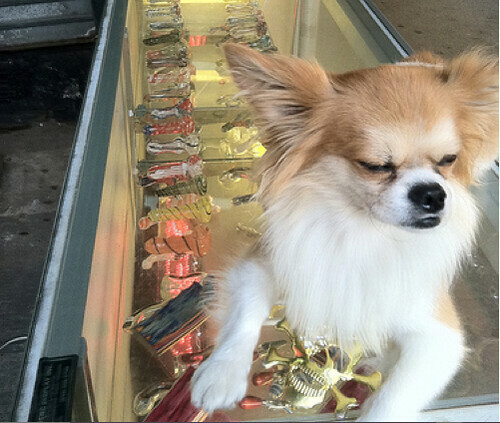 He said he’d been flouting the “owner” of the rack’s demands for months. Lauren Evans, Cafe Press The CBGB jersey spotted at REI and the snuggie from Mosaic Man’s Cafe Press line. While rumors continue to swirl about the return of CBGB, we recently spotted a way to indulge one’s punk nostalgia and comfortably ride a bicycle. 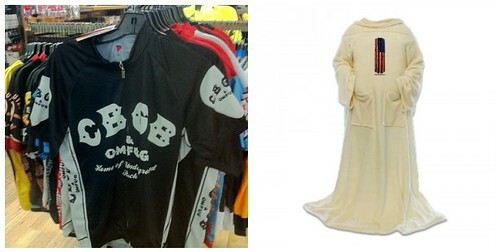 A CBGB cycling jersey is on sale at REI. So, what’s more bizarre? This punked-out polyester that’s only $70? Or the warm and cuddly Mosaic Man snuggie? 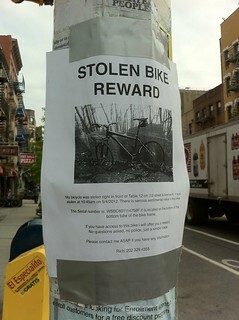 If You Saw a Bike Thief, What Would You Do? The Times shares this hilarious — and depressing — video of filmmaker Casey Neistat staging blatant “thefts” of his own bicycle, many in the East Village. (One is right in front of the Ninth Precinct stationhouse). Can you guess how passersby react to the seemingly criminal act? A new play at Theater for the New City about a bicycle shop encourages the audience to arrive by bike and then park their rides on the stage. “Bike Shop” is a one-woman musical about Bobby, a bike mechanic who tries to get back on her ride after a nasty cycling accident. 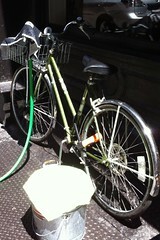 According to the theater, Bobby “builds and fixes real bicycles onstage while backed up by a four-piece ‘Bicycle Band. '” If you do end up riding to the show, which premieres on Thursday, just be careful when you make turns out of the bike lane. You don’t want to end up getting a ticket like cyclist Evan Neumann, who was so outraged by the citation he received while riding in the Lower East Side that he is suing the state Department of Motor Vehicles. Natalie Rinn The intersection of Bowery and Houston. 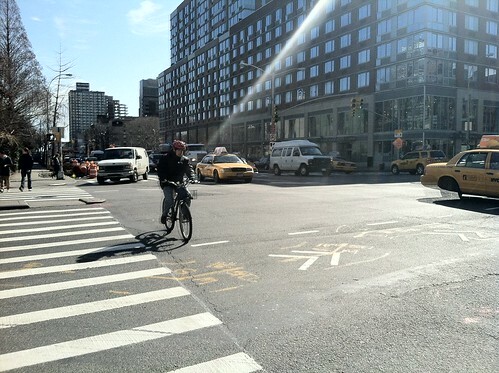 Ten East Village intersections have been targeted for improvement by the Department of Transportation, including one – the intersection of Houston and Bowery – that has seen a bevy of biking accidents. 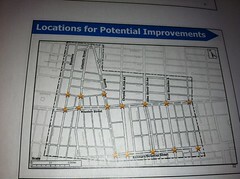 Last night at a joint meeting of Community Boards 2 and 3, the department unveiled the findings of a two-year survey covering a southern portion of the East Village as well as portions of Greenwich Village, NoLIta, and the Lower East Side. 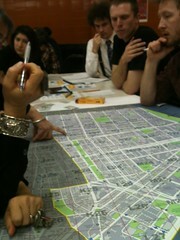 The study, which can be seen below, identified 15 intersections (10 of them in the East Village) that the city will target for future makeovers, including five intersections (one in the East Village) that were said to be “high accident locations.” From 2008 to 2010, the intersection of Avenue A and First Street saw 25 accidents, 18 of which resulted in injuries and one of which resulted in the death of a pedestrian. The city’s Department of Transportation confirmed late yesterday what seemed obvious: you can’t claim a bike rack on a sidewalk as private, even if you installed it yourself. The Local submitted the oddball inquiry yesterday after reporting on the mystery of the “private” rack on East Fourth Street. A local plumber told The Local he installed the rack at the request of Flash Courier Service, and assumed it would be available to the public. But as it turned out, someone has claimed the rack as his own, and left notes warning that the “trespassing” bikes will be forcibly removed. Unreported Cycling Accidents On the Rise? Runnin’ Scared has the harrowing tale of an actress and NYU professor, Cynthia Wright, who was nailed by a speeding cyclist while crossing Third Street at Avenue A. She didn’t file a report, but realized days later that she has several visits to the orthopedist on the horizon for damage to her face, jaw, knees and tibia. A friend then posted a sign in the neighborhood asking that the cyclist listen to his conscience, call Ms. Wright and help with the expenses. As it so happens, Andrea Peyser’s column today mentions an East Village man, Jack Brown, who was also injured by a bike but failed to go to the hospital. New timers have been installed at intersections of Delancey Street, Bowery Boogie reports. The countdown clocks, stretching from Kenmare to Clinton Streets, come two weeks after a cyclist was run over by a truck at Chrystie Street, reinforcing Delancey Street’s dangerous reputation. State Senator Daniel Squadron and City Councilwoman Margaret Chin urged the Department of Transportation to improve safety on Delancey Street today in the wake of last week’s deadly accident that killed a 52-year-old cyclist. As the Lo-Down reports, the thoroughfare had a reputation for danger prior to the most recent tragedy. Earlier this month, The Local reported that a significant number of the city’s dangerous intersections are on the Lower East Side — of those, most are on Delancey Street. Stephen Rex Brown Only on St. Marks Place. The Lower East Side’s most deadly street tragically reaffirmed its reputation yesterday, as a cyclist was killed at Delancey and Chrystie Streets. The Lo-Down reports that the rider was turning at around 6 p.m. when he lost control of his bike and fell under a cement truck. 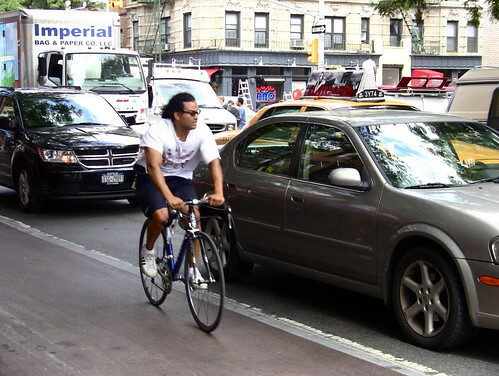 Earlier this month, we noted that the Lower East Side has the most dangerous intersections for cyclists of any neighborhood in Manhattan, with most of them on Delancey Street. The Observer discovers that model and MTV personality Alexa Chung has purchased a one-bedroom apartment on East Third Street. According to The Villager, two brothers have made a documentary about the neighborhood hip-hop scene during the seventies and eighties. “No Place Like Home: The History of Hip Hop in the Lower East Side” will screen at Clayton Patterson’s gallery next Sunday. A coloring book of Lower East Side personalities is also in the works.